Are you super excited to get your hands on the new release from Craftin Desert Divas??? I know I am! I'll do my best to contain my excitement so I can share my next project with you! 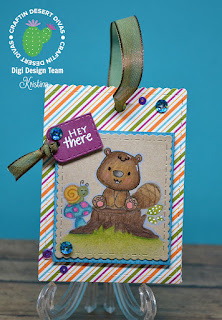 This new Treat Bag die is just so much fun! I love how you can customize it to have handles, no handles, ribbons and so on. Possibilities are just about endless! This time I colored up the Friends Like You digi stamp using my Polychromos. I also printed it out on kraft cardstock instead of white. I wanted to give it a more earthy/masculine feel and I love it. I cut the colored piece out using the layering die that comes in the set. I just love all of the mini scalloped edges. I adhered it to a turquoise piece of cardstock and popped it up with foam tape. 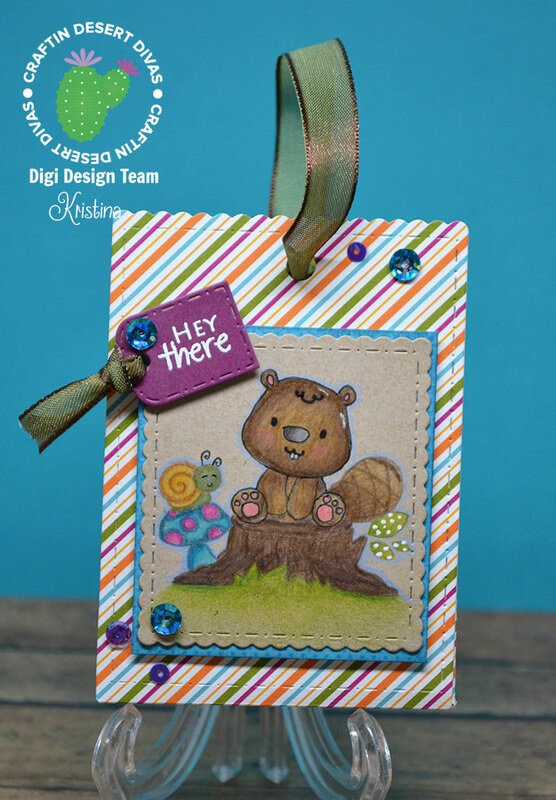 The purple tag is cut out using another die included in the Treat Bag die set. The tags in this set all have the stitching detail!! I embossed a sentiment from the Short & Sweet Tags set with white embossing powder. I also used foam tape on the back of the tag. As a finishing touch I added some sequins from Moonlit Kisses. Make sure you hop on over to the New Release section of the Craftin Desert Diva's store and pick yourself out some goodies!